Whatever birthday is being celebrated you need to send a gift and this one is excellent. 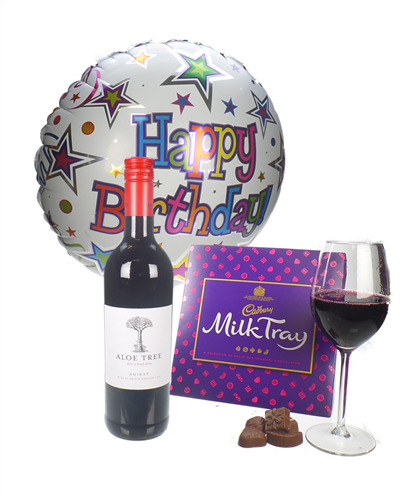 This gift contains a bottle of Shiraz, a box of great Milk Tray chocolates (200g) and an inflated happy birthday balloon which pops out the box. 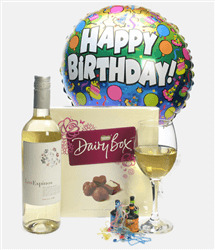 Not sure what to send as a birthday gift, fed up of sending the same old thing? then we have some great birthday gift ideas for you to choose from. Send a bottle of red wine, Prosecco, Champagne, Gin, Vodka, Rum or Whisky, the choice is yours. 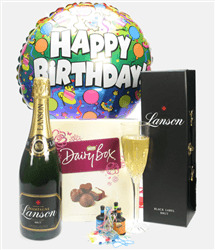 All are presented in wooden Happy Birthday gift boxes or with chocolates or try a Champagne and flute set, whichever you choose dont forget to add the birthday balloon for that extra bit of fun!